Ideal for businesses that need an efficient way to communicate and collaborate across teams. Slack is a business communication platform that provides teams with a central place instantly communicate with each other. Since its launch in 2014, Slack has gained a following among 9 million active weekly users, and is used by more than 50,000 companies. Although Slack has customers in a variety of in industries ranging from healthcare to ecommerce, the system is especially popular among tech companies and startups. Because many of Slack's features help replace other tools (e.g., built-in file uploads, voice/video conferencing, etc. ), Slack has become an essential productivity tool that helps companies of all sizes streamline their communication. $6.67/user/month-$12.50/user/month, billed annually. $8-$15/user/month billed monthly. Special offer for SoftwarePundit readers: Receive a $100 Slack credit when you sign up through our referral link. Is Slack the right software for you? 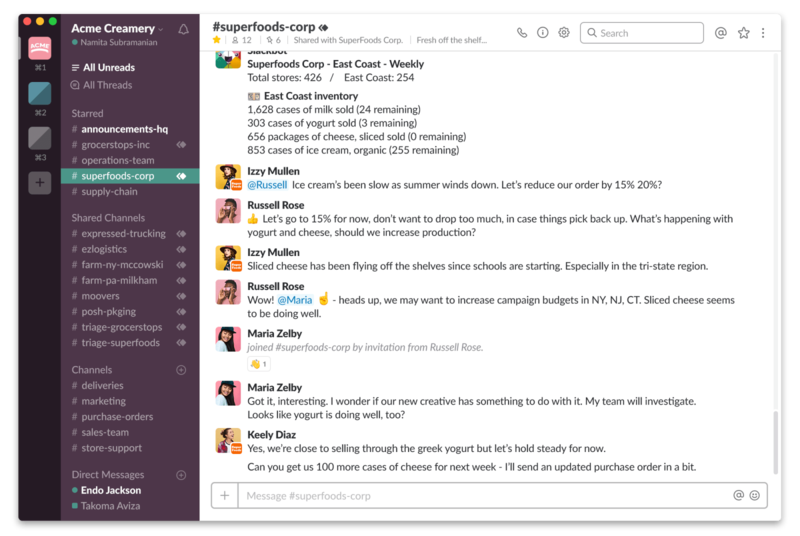 Slack is a business collaboration platform that provides teams with a central place to chat about what's on their mind, share files, and work on projects together. Designed to increase productivity by reducing the amount of time spent on drafting emails, Slack has gained a following among companies of all sizes that benefit from real-time chat and collaboration. In businesses that have adopted Slack, users view the system as an informal communication channel that helps facilitate more frequent conversations. "Just Slack me" has become a popular colloquialism amongst Slack users, which shows just how popular the system has become. Slack also integrates with various other software systems that you may use in your business, including project management tools (Jira, Trello, Asana, etc.) and file storage solutions (Google Drive and Microsoft OneDrive). And with comprehensive search features and data retention, Slack enables users to easily search across messages, channels, and files to find the information they need. However, note that Slack does not support fuzzy searches, which means that it will not yield search results that are related to your search query -- it will only find messages and files that contain the exact terms from your query, so you'll need to be precise when searching for specific terms. When should you communicate over Slack vs email? Slack is an excellent communication platform, but it's not a replacement for email -- each system has its own merits, so it's best to use them in conjunction with each other. Slack excels at facilitating quick, informal conversations where you're expecting many participants to provide input over a short period of time. This makes Slack a natural platform for ad-hoc brainstorming sessions. Slack is also a good place for teams to put their heads together when they need to diagnose and troubleshoot urgent issues. In contrast, email is less suitable for these kinds of conversations, because it is more difficult to track long message threads over email, particularly if many people are responding to a time-sensitive thread at the same time. In this scenario, it's easy for emails to drop off of the thread, since people will always respond to the most recent email in the chain. If two people simultaneously respond to the most recent email in the thread, as the thread continues, it's likely that one of those emails will get dropped off of the email chain. In contrast, Slack makes it easier to track who said what (and when they said it), since it instantaneously lists each message as it is sent, creating an easily readable, linear timeline. Email is preferable over Slack when it comes to more formal communications that need to reach a widespread audience. It is also more suitable for longer messages that you anticipate the need to share and document over time. This makes email especially suitable for company-wide announcements, and for anything else that you want on the record. If any major decisions have been made, you'll want to communicate them over email rather than Slack, because if there are any disagreements down the line, it's easy to forward an email to someone, but it's more difficult to send someone a previous Slack conversation. Below, we'll discuss the key features of Slack, and how they can benefit your business. Slack is designed to facilitate real-time conversations across teams, without overwhelming everyone with information. It achieves this by enabling employees to organize conversations into "channels" of information, while also supporting the use of direct messages between smaller parties. 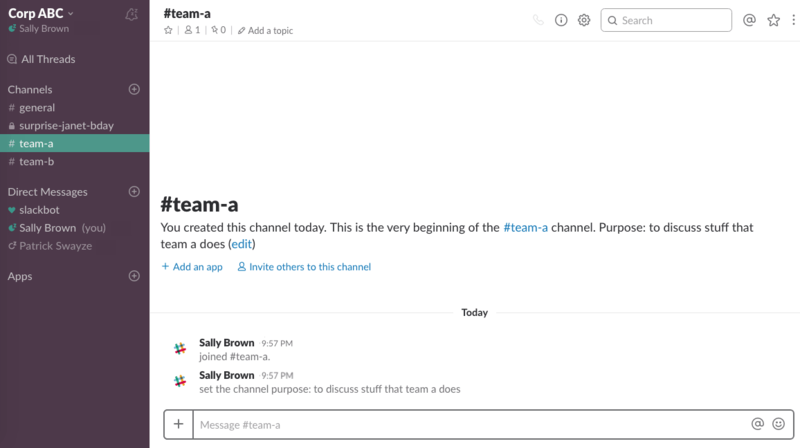 Teams typically use Slack to discuss and share files in one central location, known as their "workspace". Larger companies may want to create more than one workspace for different groups or locations across their organization. Each workspace is typically organized into various "channels", which are topic-focused chat rooms. For example, your workspace may be divided into team-focused channels where members of that team can discuss their shared projects and tasks. Channels can be public (meaning that any member of your workspace can search and join them) or private (only accessible and searchable by members who have been invited to that channel). This helps further categorize the way that information is shared and discussed across a company. Below, you can see that the "surprise-janet-bday" channel is private (indicated by the padlock icon to the left of the name), while the other team-based channels are public. Within any given channel, users may naturally start to veer off into side conversations that may not interest everyone in that channel. For this reason, Slack also released a feature called message threads, which are designed to help organize conversations and reduce noise within each channel. This enables users to veer off into tangential topics, without dominating the main conversation going on in the rest of the channel. Anyone who wants to join the message thread can expand the message thread and respond to others within that thread. This feature is particularly useful for highly trafficked channels that host a lot of members and messages, and helps each channel stay on topic without making users feel like they can't converse about side topics, if and when they arise. Slack also recently announced a Shared Channels feature (currently in beta), which helps bridge two companies' Slack workspaces by opening up specific channels where members of each workspace can securely collaborate without accessing other parts of the other company's workspace. As shown below, Shared Channels look like normal channels, except that they are listed in their own category in the sidebar. This helps facilitate collaboration with external contacts, since employees can collaborate with external contacts in the same place where they also communicate with internal teams, instead of having to switch back and forth across tools or mediums. It also helps prevent issues associated with inviting external contacts to your chat application as guests, which could get disorganized and result in permissions issues or accidental exposure of confidential information that should be kept internal to the company. In addition to its real-time chatting features, Slack also includes built-in video chat and phone calling functionality, so that users can easily transition from a chat to communicate through other mediums when necessary. During a video call, you can also use screen sharing to illustrate what you're talking about. Although this works for quick phone calls and video chats, keep in mind that since Slack is primarily focused on developing features for chat-based communication, its video conferencing capabilities may never be as robust as Skype or Google Hangouts Meet (which is why it integrates with these systems). For example, if you need to take a recording of a video chat, you won't be able to do so in Slack. Slack is designed to be used in combination with many of your team's existing tools, ranging from G Suite applications like Calendar and Docs, to project management tools like Trello and Asana. Users can customize their Slack workspace by making these tools easily accessible within direct messages and channels, which means that they won't have to switch back and forth between applications during a conversation. For example, if you come up with an idea for a new project while talking to someone on Slack, you can use Slack's Trello integration to create a card in Trello, simply by writing out a simple Slack command: "/trello," followed by the text you want to write in the card. You can also use Slack to trigger other actions in Trello, such as updating the due date of a card. Slack also integrates with other file storage solutions like Dropbox, Google Drive, and Microsoft OneDrive. It also offers users a certain amount of file storage space based on their pricing plan. Users can easily search through their message history, so that they can easily locate specific conversations and files. Paid customers can also set up a custom retention policy, and will be able to search through all of their message history (whereas the free tier limits search to the last 10,000 messages). You can also access a log of the files you've shared with others, and the files that others have shared with you in the past, as shown below. This saves you a lot of time, since you no longer have to remember who you were talking to, and request the file from that person -- instead, you can directly search through Slack for your past conversation, locate the file that you need, and download it directly from Slack. 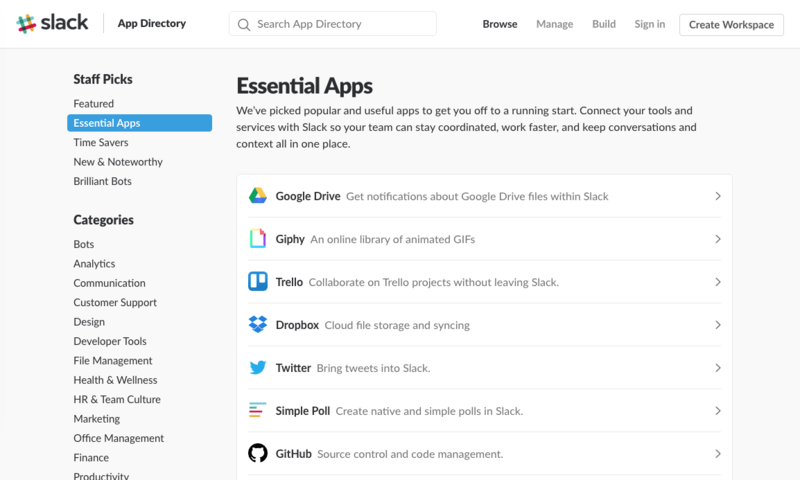 Slack provides technical users an API, in order to encourage teams to develop their own custom integrations. For this reason, it has gained a following among tech companies that have software developers who can code custom integrations in order to make Slack serve their exact use case more efficiently. Slack also offers something called the Slack Fund, which provides funding for startups that are building solutions involving Slack's technology. Because of its efforts to encourage developers to create integrations that other Slack users can benefit from, Slack has accumulated more than 1,000 third-party applications/integrations. These integrations range from popular enterprise solutions like Microsoft OneDrive and Salesforce, to custom chat bots like Vacation Bot, which is a bot that listens for any conversations that mention that you'll be out of the office, and asks you to confirm when you'll be on vacation so that it can change your status accordingly in Slack. Slack's API makes it possible for software developers to create custom integrations that react to certain snippets or terminology throughout their teams' conversations, based on their very specific needs. This means that potentially you could build custom applications and bots that enable you to trigger actions based on Slack messages and conversations, and/or control specific parts of your workflow right from Slack. 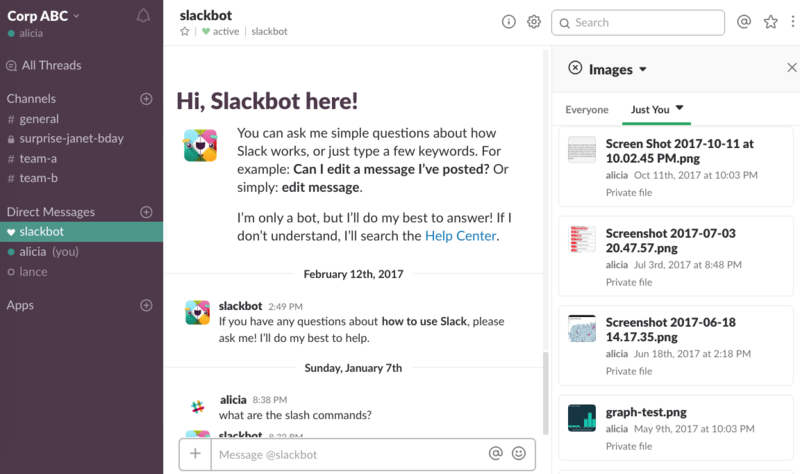 Slack includes a default bot called the "slackbot," which answers questions about Slack features, and will automatically respond to default slash commands in messages. One example is the "/remind" slash command (explained below), which will trigger the slackbot to create a reminder in Slack, based on the time and text you provide. For example, let's say that you send the slackbot a message with the following text: "/remind me to call Lucy at 3pm tomorrow." The slackbot will automatically respond with a message that confirms that it will remind you to "call Lucy" at that time, as shown below. You can also create your own custom slash commands to either trigger an action in another application, or query information from another application programming interface (API). Slack also enables you to specify when you want to get notifications (specific channels, mentions of a certain word, etc.). You can use this feature to ensure that you don't miss important messages that matter the most to you, without getting overloaded with notifications about every single message. Is Slack right for your business? Slack is a rapidly growing business collaboration platform that has gained a reputation for facilitating communication and increasing productivity in the workplace. It also offers an impressive number of integrations with widely used applications, including business applications like G Suite by Google and Microsoft Office 365, as well as project management software like Trello and Asana. These integrations (as well as Slack's support for creating custom integrations) have enabled it to fit neatly into many companies' existing workflows. Slack's chat-based features are particularly beneficial to companies that have a large number of teams and employees. The robust chat-based features can help facilitate conversations across teams, and can also encourage team members to collaborate on a more frequent basis. However, even smaller teams can benefit from Slack's integrations, which enable users to do everything from setting up automated reminders for themselves, to responding to calendar invites without having to switch to Microsoft Outlook or Google Calendar. Although Slack offers some built-in video-conferencing and screen-sharing features, it's important to understand that it is primarily centered on chat-based communication -- so if you need robust video conferencing capabilities, you will still need to invest in a full-fledged web conferencing system like Skype, GoToMeeting, or Zoom. However, Slack's video conferencing capabilities are sufficient for those looking for basic video chat functionality. Like any other software as a service solution, Slack does occasionally run into availability issues. However, it offers a 99.99% uptime guarantee, and its service-level agreement states that it will refund 100X the amount each customer paid over the duration of time that it remains unavailable. You can view a record of Slack's past availability issues, as well as its current state, on this live status page. Before investing in a solution like Slack, you'll need to weigh the pros and cons of relying on a SaaS solution like Slack, and make sure that you think it's reliable enough to suit your use case. If you're looking for a real-time communication platform that integrates with your existing business applications, and helps drive more effective conversations within and across teams in your organization, then Slack is the best option on the market. To learn more about Slack, you can visit their website here.